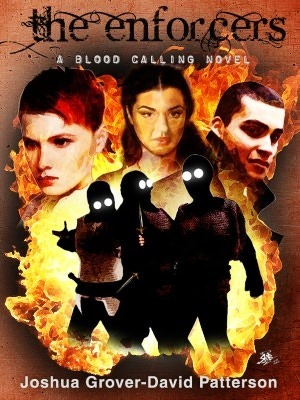 The final book in Patterson’s Blood Calling Series, The Enforcers offers an action packed, riveting story to readers, as well as the perfect closure to this amazing trilogy. Patterson’s novel brings back the beloved characters of Lucy, Wash, and Emma, as they fight not only to clear their names, but also for justice against the Enforcers, a group of rogue vampires who take it upon themselves to wipe out any and all vampires who threaten to reveal their way of life. Bring into the mix a human now on the Enforcers’ radar due to helping his vampire friends move during the daylight, an angry “baby” vampire wanting nothing more than to go home to her parents, and a police investigation hot on their tails with the Enforcers closing in from the other side, and you’ve got an amazing adventure. Patterson expertly weaves his tale, explaining the intricacies of not only the characters and their dilemmas, but also the mysterious Enforcers. Up until now, the Enforcers have always been a serious threat, but Lucy, the protagonist, didn’t always understand exactly how dire their situation really was. As the story unfolds, and the reader learns more about the Enforcers bloody beginnings and Emma’s close brush with death at their hands, it becomes clear that the Enforcers will stop at nothing to destroy anyone who stands in their way, and if that means killing an entire township of humans in their quest, so be it. I loved the presentation of the Enforcers, the group that should represent good, a policing force for the underground vampires, but they’re anything but that. The Enforcers’ heartlessness and self-preservation is the perfect foil for Lucy and her friends as she attempts to do the right thing, but how far will she and her friends go to protect themselves and everyone they love? Caught between the desire to live in safety and the need to protect the innocent, Lucy, Wash, and everyone else must make some extremely difficult choices, and not everyone will walk away unscathed, making this an intense, but wonderful read. I was surprised by the conclusion of the novel, yet it works perfectly with the series and, though a clean ending, leaves room for more if Patterson ever decides to continue the series, which I hope he does. The Blood Calling series an enthralling series, and it’s come so far since the very first book. I think this is the best book of the series yet. This is the final book in the Blood Calling series. The little band of Misfits now have more things to worry about . Charisma is now with another more dangerous vampire named Nathan. Emma and Lucy try to try to get her back to Bets. It doesn't go well for them ,Nathan is very smart and he doesn't give up his possesions so easy. They still try to reason with him, he will not comply. So Emma begins to fight him. Against better judgement Lucy gets Charisma, but the fight occurs in a bar called The Pitt. Now everyone in The Pitt is video tapeing the fight and is posting it on You Tube . Well you guessed it. The Enforcers are on there way.They will burn down the whole place just to protect there secret. Even if there's innocent people in it. Emma,Lucy and Wash along with all the other characters face a boat load of trouble. Vampires fighting Vampires. How can it get any worse believe me it does. The ending was riveting and very well put together. Highly recommended and a very fast read . Joshua Grover-David Patterson - Joshua Grover-David Patterson is a freelance writer, screenwriter and blogger. His articles on pop culture, film and the Internet have appeared in The Post-Crescent, Bull magazine, delight! magazine and Film Threat. Patterson’s films have won 13 awards and appeared in 29 film festivals all over the world, including in Japan, Australia, Hungary, Norway, the UK and throughout the United States. Patterson lives in Wisconsin with his wife and their daughter. You can follow him via Twitter at twitter/GroverDavid, Like him on Facebook at facebook/JoshuaGroverDavid, or follow his book-blogging at groverdavid.